Producer/Winery: Tablas Creek Vineyard; Paso Robles, California. Geographic Appellation: Adelaida District Paso Robles; Central Coast, California. Purchased From: Tablas Creek Vineyard tasting room; Paso Robles, California. 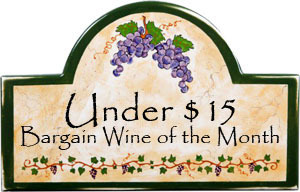 Paired With: Braised short ribs with Madeira sauce, mashed potatoes and peas. Opened one hour before drinking. Opaque, very dark garnet color with the same color rim. Powerful plum and blackberry aromas with strong hints of new oak barrels and blackberry jam spread on warm toast. Smooth, lush, medium body, 200-grit texture. From start to finish the wine had an enormously strong dusty character that’s wrapped in intense ripe plum, licorice and tobacco flavors. The rich fruit flavors continue on with fresh acidity, fine-grained grippy tannins that build through a medium-length spicy finish. Smooth as silk, but a VERY powerful wine that paired well with the braised short ribs (a recommended Tablas Creek pairing for this wine). Lots of California sunshine…gobs of rich fruit and alcohol, but there are still hints of the Pyrenees to give it an old world flare. 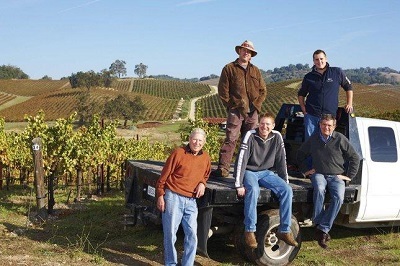 (Clockwise from left): Tablas Creek Vineyard founder Robert Haas, winemaker Neil Collins, Cesar Perrin, Francois Perrin and general manager Jason Haas at Tablas Creek. The vineyard is owned in partnership with the Perrin family of Château de Beaucastel. Photo from Tablas Creek Vineyard. Comments: Learn more about Tablas Creek Vineyard and their wines. 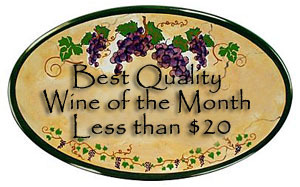 See also: Other Tablas Creek Vineyard wines we have reviewed.